When hiking, knowing where you are and where you’re going is pretty integral to the whole operation, which is where GPS technology comes in. The best way to harness it? With the best hiking GPS, of course. A GPS device with a touchscreen is a nice feature, but isn’t so much cop in bad weather, so while we’ve listed it for each product as a useful inclusion, it’s not a reliable indicator of what makes a good GPS for hiking. As such, we’ve put the somewhat old-fashioned-looking but undeniably useful Garmin e-Trex 30 at the top of our list. In fact, Garmin are responsible for every entry on our list thanks to their sheer standout excellence in the field (and the track, and the hill, and the heath), so when it comes down to choosing the right unit, it’s mostly a case of budget. The Garmin Oregon 650t is the most fully featured of our picks, but also the most expensive by a country mile, while the inReach Explorer+ is second priciest, but includes the option to send messages via satellite, which may make the outlay worth it for frequent forays. The Garmin e-Trex 30 has been around for a while now, but its appeal hasn’t lessened even in the face of slightly more flashy handheld GPS options. Its IPX7 waterproof rating and side button/joystick control combo (no touchscreen here) means it’s usable in all weathers, and reviewers found it suitably compact and lightweight at just shy of 150g including its batteries. Users also commented favourably on its fast-acting satellite latching, saying it rarely loses contact, and were impressed that it matched the functionality of some higher-end models with features like wireless sharing, tri-axial compass and Garmin Chirp technology. Expert testers said the Garmin Oregon 650t offered the most wide-ranging skill set of any hiking GPS receiver on the market, and its functionality in conjunction with its best-in-class ruggedness seem to make it worth the undeniably high price. Reviewers said the touchscreen was both incredibly sensitive and impressively durable, and were wild about the onboard camera which, while it might not be a challenger for the Nikon D60 any time soon, eliminates the need to carry a separate device. The choice of included rechargeable battery or AAs is a huge bonus, too. If you’re looking for something between the e-Trex 30 and the Oregon in terms of price and functionality, you’re in luck with the Montana 680, which reviewers say is a great mid-range option. Testers found this receiver to be the most powerful out of a range they’d tested, offering excellent accuracy and reception and a superbly user-friendly large screen with an easy-to-use interface. The 8MP camera and 4GB of internal memory show just what a powerhouse it is, too. Naturally, this all means it’s quite large and heavy, so best avoided for backpacking, but fine if you’ve got the space and weight to spare. 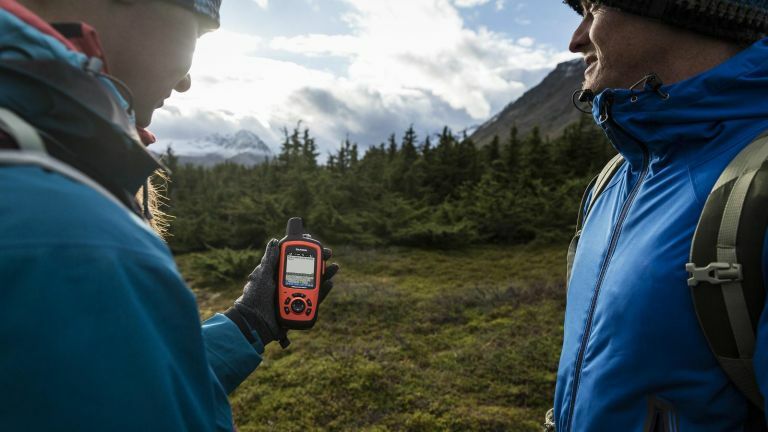 The Garmin inReach Explorer+ proves you don’t have to choose between shelling out for a separate satellite phone and – quelle horreur – completely cutting ties with the outside world when you’re on a hike. If you spend a lot of time off the grid, this is a great handheld GPS device that also lets you stay in touch using satellite messaging, sending notes to both telephone numbers and email addresses. Testers found that while it could take a few minutes to send and receive messages (you need to wait for satellites to pass over) the reception was incredibly reliable. Infrequent hikers who don’t want to take their phones out on the trail seem to be the target audience for the eTrex 20x: it’s rugged, it’s waterproof, and it’s way under £200, so basically the opposite of most smartphones, and a great value buy for those who don’t want to invest too much but still want decent functionality for their buck. While the unit only comes pre-loaded with a base map, you get the full benefit of Garmin’s own functionality, including free software Basecamp which lets you plan routes and load them onto the eTrex, and tons of free downloadable topo maps.